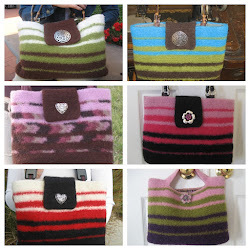 Sooo...I've been designing and creating purses for a while now and am finally putting an update. I really love mixing and matching various colors to make beautiful combinations. So far, I've been using only Patons Classic Merino Wool. I have used Joann's Sensations Kashmira yarn and actually really liked that one, as well. So, without further ado, here are the bags from the Gege collection thus far. 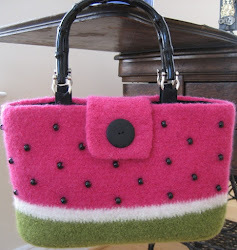 This bag is the very first one I created. I call it Johnny Five- and it's ALIVE! Ha! I slay me. It's the key to unlocking my heretofore unknown bag-making, dare I say...oh I will... g.e.n.i.o.u.s. (Yes folks- the best quality of mine, and I have many good ones, is my humility. I'm very proud at how humble I am. And my spelling. I spell real good.) 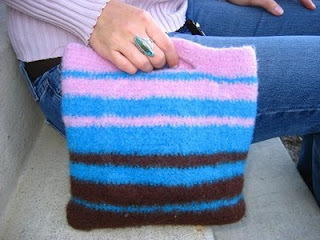 I added an interior pocket which was added pre-felting, so it is part of the entire purse fabric. This will be for sale on my etsy site....once I set that up. Hee. 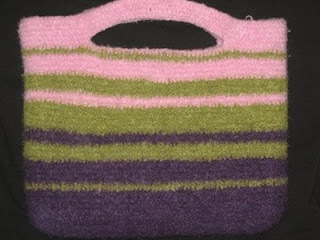 This next one is the PGP bag- Purple, Green, Pink. This one is actually not completed yet...I still need to line it and add a magnetic clasp. 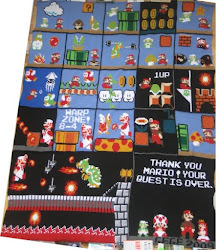 But, since I'm posting all my preciouses (yes, that's a word...just ask Gollum), I'm adding this one and will post an updated pic with the lining later this week. I really like your purse. I saw them on craftsters. 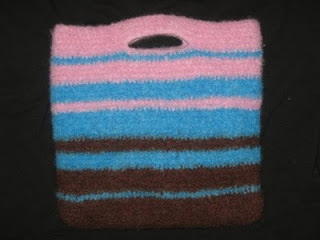 I want to get into felting. Can I use acrylic yarns? All the patterns and tips I keep findign ssay to use wool, but I'm allergic. Hi Christina! Thanks for stopping by! Yep- as far as I know, unfortunately you can only felt with wool. Acrylic yarns will not felt at all. Are you able to try wool blends? Pattons SWS is a wool/soy mix and felts extremely well. (I've actually not used it myself, but I've seen the results and they are beautiful.) If you are allergic to any amount of wool, then I'm afraid that won't work for you, either. 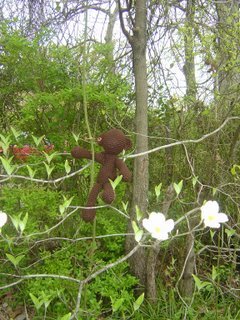 :( Maybe you can force someone to make something out of wool for you and then felt it and you can claim it as your own. Have you recently saved someone from an imminent, gruesome and certain death from an international espionage ring and they owe you their life??? If so, call in that favor STAT! :) Good luck!!! I really enjoyed your crochet a lot. Your are so talented and have a sense of creativity.Your work is so neat and perfect. Thanks a lot for sharing your art on the blog pages.